What is it? – Star Beacons is a high quality shooter-puzzle game in which you play the role of the furry blue alien in a spacesuit resembling an old-school diving helmet who must collect oodles of star pieces to restore his planet’s shattered sun. Who made it? – The game was created by developer Steel Panda, and is a companion piece to the excellent action-adventure game, Casual Space. You’ll have a limited number of shots for each level, but you can earn more shots by landing a ball in a moving exit portal at the bottom of the screen, or by ricocheting off of a high number of obstacles during your previous attempt. 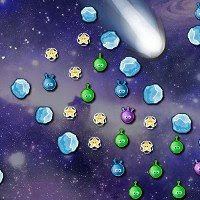 As you progress through the game, you’ll be presented with even more obstacles, such as black holes and comets. Presentation – From the colorful graphics, to the charming art and sound effects, Star Beacons is a very polished experience. If you’ve played Casual Space, you’ll immediately recognize that the plot and characters and art are all the same, but that the core gameplay is very different. Positives – Each level is well designed and (as mentioned) the game is visually impressive. As with Peggle, there’s something quite addictive about watching your shot careen around the board, plinking and plunking into the different obstacles. Even with the inclusion of an arrow that helps you determine the path of your shot, the game’s excellent physics keep things from becoming too easy or predictable. Negatives – While definitely a quality game, it’s far from original. If you’re not a fan of Peggle, there’s not a whole lot about the game that will likely appeal to you. Why you should play it – Star Beacons is a fantastic knock-off that’s almost as good as the game on which it’s based. It’s relaxing and not very reflex-intensive, but still manages to be a fairly compelling experience. Check it out, and don’t be surprised if eats into your day more than you’d like.